When a R.E.A.D. dog is listening, the environment is transformed, a child’s dread is replaced by eager anticipation, and learning occurs. The handler is a skilled facilitator, too – shifting performance pressure off the child and providing support, while the child gets the supervised reading practice necessary to build vocabulary, increase understanding of the material, and gain fluency as a reader. Participating kids make enormous strides in reading communication skills while, along the way, building self-esteem, confidence, and social skills. And there are bonus benefits – performance in other subjects tends to improve, as does attendance, and even personal hygiene. For more information about R.E.A.D. see the Frequently Asked Questions. For information about R.E.A.D. Dogs Minnesota click here. These videos video introduce the R.E.A.D. 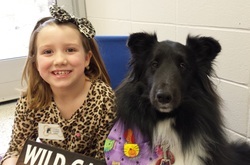 program that brings therapy animals into elementary schools and libraries to help children with reading. Find out how dogs help children develop reading skills. Common concerns about bringing dogs into schools and libraries are addressed.